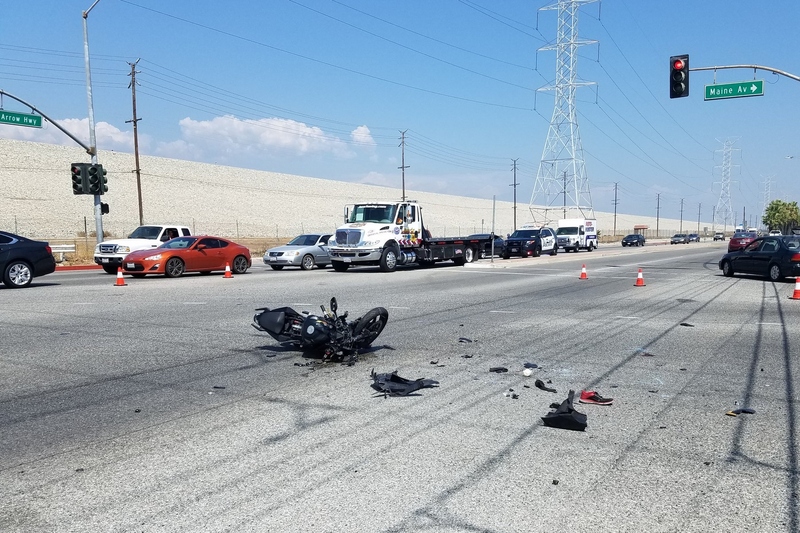 A crash between a motorcycle and an SUV on Arrow Highway in Irwindale sent the 19-year-old motorcyclist to a hospital with major injuries, authorities said. The collision took place about 1:20 p.m. at Arrow Highway and Maine Avenue, on the border between Irwindale and Baldwin Park, Irwindale police Sgt. Rudy Gatto said. The motorcyclist, a West Covina man, was riding east on Arrow Highway just prior to the crash, the sergeant said. A Mitsubishi SUV being driven by a 21-year-old Covina man was making a left turn from westbound Arrow Highway onto southbound Maine Avenue. “They collided in the intersection,” Gatto said. Paramedics rushed the badly injured motorcyclist to Los Angeles County-USC Medical Center for treatment, according to Gatto. He was unresponsive, but had a pulse, when transported. Gatto said the driver of the SUV remained at the scene and cooperated with investigators. There were no initial signs of impaired driving. Anyone with information can reach Irwindale police at 626-962-3601. 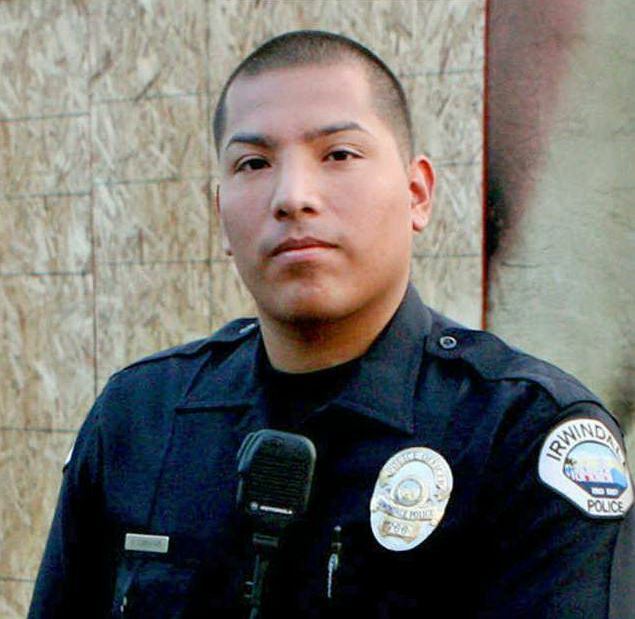 IRWINDALE >> Irwindale city officials have selected a new top cop to head the Irwindale Police Department. Capt. 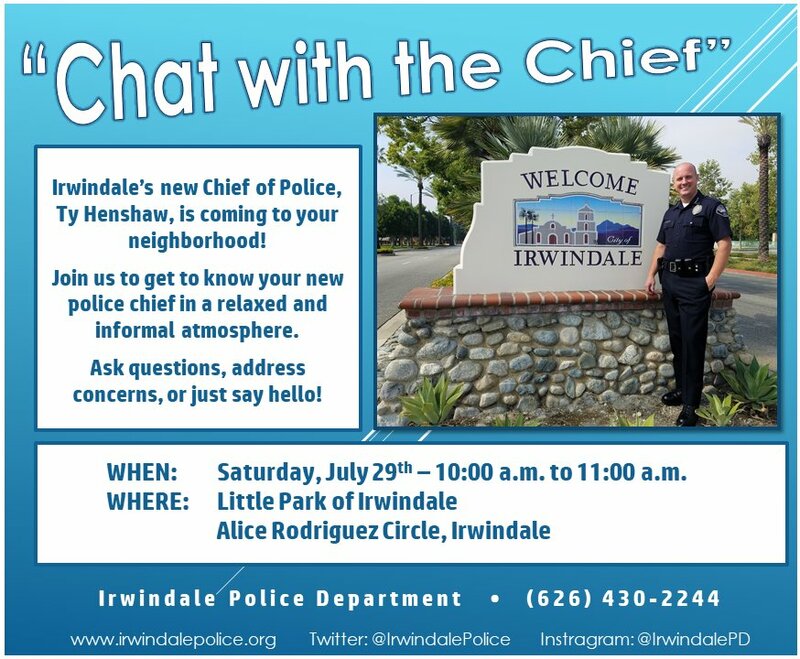 Ty Henshaw will begin his tenure as Irwindale Police Chief on Tuesday. He replaces outgoing Chief Anthony Miranda, who is leaving the department serve as Chief of Police in Vernon. 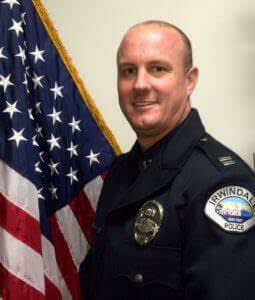 Henshaw has been a captain at the Irwindale Police Department since 2014, officials said. He began his law enforcement career with the Bell Police Department, where he rose through the ranks to ultimately become interim police chief, according to Sgt. Rudy Gatto. The new chief said law enforcement has become a family business. “My two older brothers were police officers,” he said. Henshaw said he became hooked on the profession after going on ride-alongs with them and soon joined the Police Explorer program in Orange County as a teenager. He said he’s enjoyed his career in law enforcement. From detective work to administration, Henshaw has worked nearly every law enforcement assignment, city officials said. “I’ve done just about everything except riding a motorcycle,” he said. Henshaw, 45, lives in Chino Hills with his family. The incoming chief earned a Master of Science in Emergency Services Administration fro California State University, Long Beach, as well as Master of Public Administration from California State University, Northridge. He is a state boar member for the California Peace Officers’ Association and formerly serves as the Region Chair for the CPOA’s Los Angeles Chapter, Gatto said. Henshaw also serves as a professor at Cerritos College in Norwalk, where he teaches in the Administration of Justice Department, Gatto said. In taking the help of the Irwindale PD, Henshaw said he was reminded of an old adage that says the best way to predict ones future is to create it. “I’m really excited to be in a position now where we can create,” he said. IRWINDALE >> Police are seeking a crew of robbers caught on video smashing their way into an Irwindale seafood restaurant early Thursday before making off with two safes and a cash register, officials said. 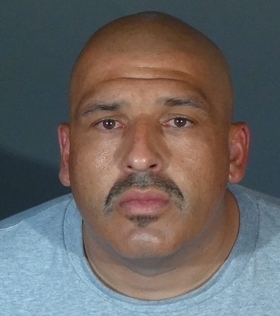 The break-in involved “as many as six suspects” and took place about 2:50 a.m. at Mariscos Uruapan, 16034 Arrow Highway, Irwindale police officials said in a written statement. “The suspects made entry to the location by smashing the front glass,” according to the statement. “Once inside the restaurant, the suspects stole two safes containing an unknown amount of cash. The suspects then fled the location in two separate vehicles. He said the burglars first forced their way into a separate nearby storefront also owned by the restaurant and used for overflow storage. They then turned their attention to the main restaurant, which contained the safes and cash register. Surveillance video released by police in hopes of generating tips from the public shows the suspect head directly for the restaurant’s office and kick in the door. They then forced two seemingly bolted-down safes free from the floor and carried them away. The burglars also stopped to grab the cash drawer portion of the business’s cash register. All of the burglars wore dark clothing, including masks and gloves. One wore a red hooded sweat shirt with the words “The Label 400” written on the back. The two cars used in the crime were described as newer-model, dark-colored sedans. Authorities had yet to determined how much money was obtained in the crime. 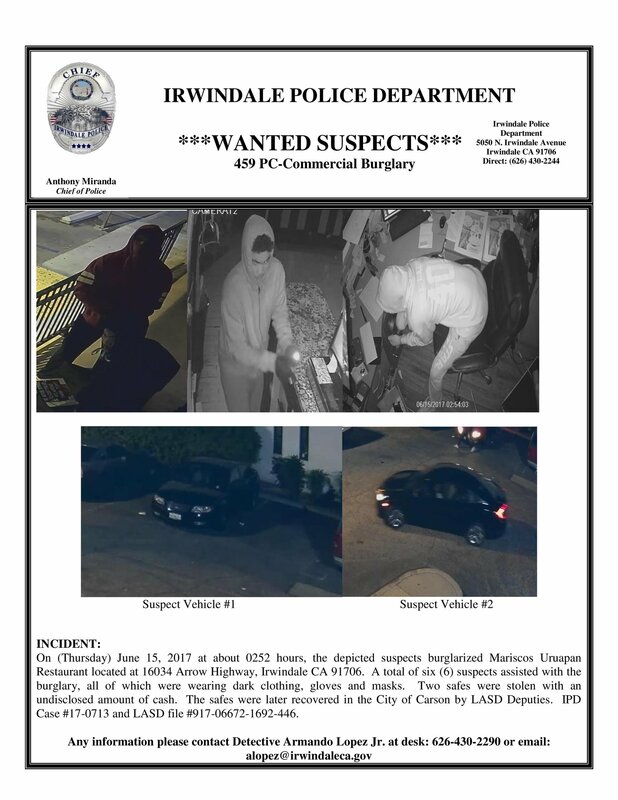 Anyone with information, or who recognizes the burglars, is urged ton contact Irwindale police Cpl. Armando Lopez at 626-430-2290, or via email at alopez@irwindaleca.gov. Tips may also be submitted anonymously to L.A. Regional Crime Stoppers at 800-222-8477. Two men robbed a 72-year-old man riding his bike home from a doctor’s appointment at gunpoint on Tuesday in an unincorporated county area between Covina and Irwindale, authorities said. A 72-year-old man was riding home on a bicycle following a doctor’s appointment about 11:10 a.m. when two robber approached him in a silver Toyota compact car at Irwindale Avenue and Queenside Drive, Los Angeles County sheriff’s Lt. Thomas Reid said. The car pulled in front of the bicyclist, blocking his path, he said. The driver pointed a handgun at the senior citizen and demanded he turn over a backpack he was carrying. A passenger emerged from the car and took the victim’s backpack, which contained credit cards and other personal items, according to the lieutenant. Both robbers then fled in their car. The gunman was described as a Latino man in his 30s with black hair. No description of the second robber was available. Anyone with information can reach the sheriff’s San Dimas Station at 909-450-2700. Tips may also be submitted anonymously online to L.A. Regional Crime Stoppers at 800-222-8477. 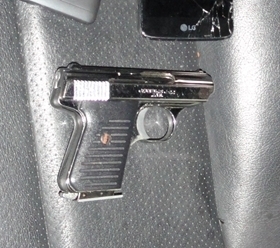 IRWINDALE >> What began as a routine traffic stop for a broken tail light resulted in the arrest of a known gang member with a loaded pistol and a stun gun early Saturday, authorities said. Brian Rodriguez, 22, of La Puente was booked on suspicion of being a carrying a loaded gun, being a gang member in possession of a gun and bring a weapon — a stun gun — into a jail facility following his arrest shortly after midnight at Irwindale Avenue and Arrow Highway, Irwindale police Sgt. Rudy Gatto said. An officer pulled Rodriguez over after noticing the Volvo sedan he was driving had a non-operating tail light, the sergeant said. 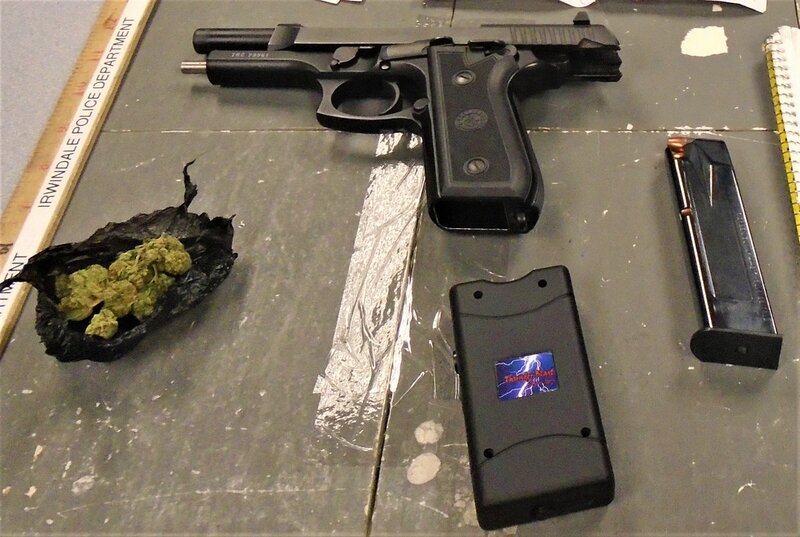 During the traffic stop, Rodriguez admitted to having a loaded 9mm handgun, which was recovered from beneath the driver seat of his car, he said. A small amount of marijuana was also recovered, thought the substance is no longer illegal to possess following November’s ballot initiative which legalized recreational marijuana for adults. While in the process of booking Rodriguez into jail at the Baldwin Park Police Department, officials discovered he had a stun gun concealed on his person, Gatto said. According to Los Angeles County booking records, Rodriguez was being held in lieu of $50,000 bail pending his initial court appearance.